This article will cover managing the Apps on your Knack account. 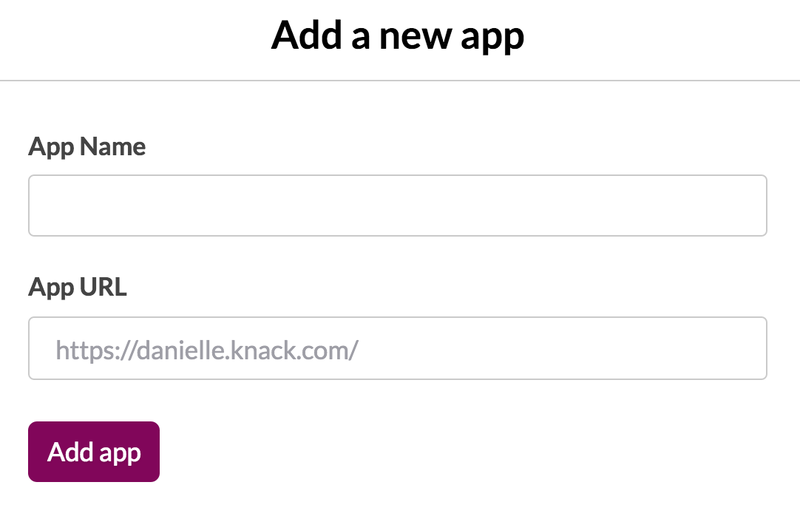 To create a new app, login to the Knack Builder at builder.knack.com and select the "Apps" tab on the Knack Dashboard. Then from the “Apps” tab, select the “+ Add App” button. Next you will have two options, to build an app from scratch or use one of our pre-made templates. If you select "Start From Scratch", you will then be prompted to give your new app a name, and set the URL for the app. After selecting "Add app" this will create a completely empty app. Then it will redirect you to the Builder for your new app so you can start creating. If you select "Pick a Template" this will allow you to pick one of our pre-made templates which you can edit to make your own. Once you select a template, you will then be prompted to give your new app a name, and set the URL for the app. You can view all our Template Apps here. You can copy any app directly from the Knack Dashboard. Some users wish to copy their apps, either to repurpose the app, transfer to another account or to keep a copy as a backup. To copy your app, navigate to the Knack Dashboard and select the advanced options icon on the app you would like to copy. Then select "Copy" from the dropdown options. Next, this will open a popup modal, where you can name your new copied app and select a copy option. New app name: This is the name for the newly copied app. Copy Records: This will copy all records in the app, along with the app structure. Copy Tasks: This will copy all tasks in the app, along with the app structure. Pro plan and above. Press Copy to start the copying process. Note: If you've selected to copy records, it will take some time before all records appear. To copy an app to another account, you will need to submit a copy request to support@knack.com. We will need confirmation from both Knack accounts involved, so you will need to CC the email address associated with the recipient's Knack account in this request to help expedite this process. We will not be able to complete the copy request until a confirmation is sent to us from the email address associated with the account the app is currently on, as well as the email address associated with the Knack account that will be receiving the app. The name of the app to be copied. The email address associated with the account the app is being copied to. Please don't forget to CC this email in the request so that they can confirm that they would like this app copied to their account. Whether you would like the records and app structure copied, or just the app's structure. You can add Shared Builders to your apps, which will allow others to edit your app. They will be able to fully edit the app you share with them, including adding, editing, and deleting elements from both the Data and Pages sections of the Builder. You can read about adding Shared Builders here. When viewing your apps from the Knack Dashboard, you can see the record count and storage used for each app under the app name. Records: This total represents all the records stored by each object in your app. Storage: This total represents the size of everything that has been uploaded to your app. It may take some time for the record counts to update. So, you can always force a count refresh by selecting the actual count number in your Dashboard, as seen above. Then select the "Refresh Record Count" button to confirm the refresh. If you need to save space in your app, you can clear out any unused assets. These unused assets are files and images that may not be in use anymore. We keep unused assets in case backups are ever needed. To clear these unused assets, select the storage size in your Dashboard, as seen above. Then select "Delete Unused Assets" to confirm. Note: Deleting unused assets can't be undone! They won't be recoverable in case you need to restore your database. If you happen to be using path URLs for uploaded files or images where the object has been deleted, note that clicking "Clear unused assets" will remove these uploads files and images. To delete an app, navigate to the Knack Dashboard and select the advanced options icon on the app you would like to delete. Then select "Delete" from the dropdown options. This will open a page to confirm you are deleting the entire app. 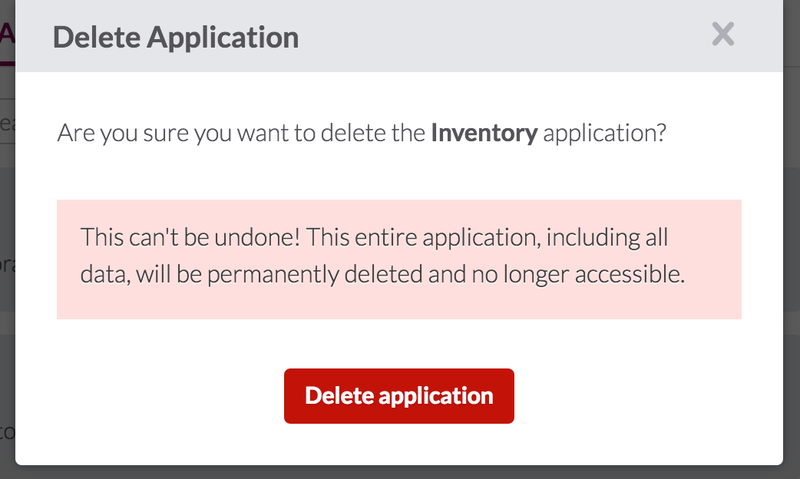 If you wish to continue, select the "Delete Application" button and you app will be deleted. Note: This can't be undone! This entire application, including all data, will be permanently deleted and no longer accessible. You can edit App Settings in two places in the Knack Builder. Some basic settings can be edited from the Knack Dashboard, by selecting the "App Settings" options from the advanced options. This will open a modal popup where you can edit the App Name, App Slug, and Description. You can edit the complete App Settings, by selecting "builder" from the Knack Dashboard when viewing your apps. Once in the Knack Builder, select "Settings" from the app options in the top left corner. App Name: This is the name of your app which will appear in the app header. App URL: This is the text which will appear in the URL when viewing the app. App Email Address: This is the primary email used for this app, which will be the "from" email the app will use when sending emails. Timezone: The timezone the app will use for fields using date and time values. Daylight Savings: This will enable/disable daylight savings for the fields using date values. Language: The default language for the app. Enable IP Blocking: If enabled, only IP addresses listed here will have access to the app. Leave blank to disable. This is available on Pro and above plans. Secure Browser: With this setting enabled, if anyone accesses your Live App on http://, they'll automatically redirect to the https:// version. Data Location: Location of the server your app is hosted on. If needed, a request to EU servers can be made by clicking the "request EU migration" link. HIPAA Compliant (US Only): Current HIPAA Compliance status of your app. If you're interested in becoming compliant, click the "become compliant" URL for more details. Total Records: A snapshot of the total record count stored in your app. Total Storage: A snapshot of the total asset storage used in your app.